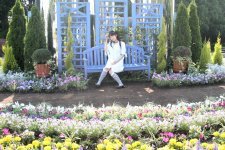 Itou Asuka's third photo session took place on June 2, 2007. It had been over four years since her previous one! There were 4 people who participated. This was my first photo session in about one year. Before lunch, Asuka was wearing a black top with red cherries, and a black skirt. She was also wearing black "over the knee" socks and black shoes. We took photos near a flower garden, and a small pond, for about one hour. After lunch, Asuka changed into a light blue one piece. We took photos near a setting for a traditional Japanese style house, near a fountain, a trail in the woods, and some flower gardens. The afternoon session was around 3 hours. It was very windy, and the water from the fountain was blowing all over. So we couldn't get too close to the fountain. I took 380 photos with my 20D with 312 of them worth saving. I hadn't used my camera in about 8 months. I'm glad that my lenses were still ok, and my batteries were still alive. I used my 24-105mm F4L IS zoom the most. In the past, I used my 50mm and 85mm lenses during the photo sessions, but this time I got lazy and used the zoom. I also used my 70-200m F2.8L for some distant shots where I wanted to blur the background.